To often trees are planted and that's the end. They are tortured by wire in a hose and they are too often tortured by neglect. Would it not be wonderful if we were responsible for what we planted? Young trees planted in urban environments would be best, if at least a five year maintenance programs by someone who understands tree biology, (SWUTB) is achieved. These newly planted trees, if planted correctly (most are not), require special care for at least the first five years. 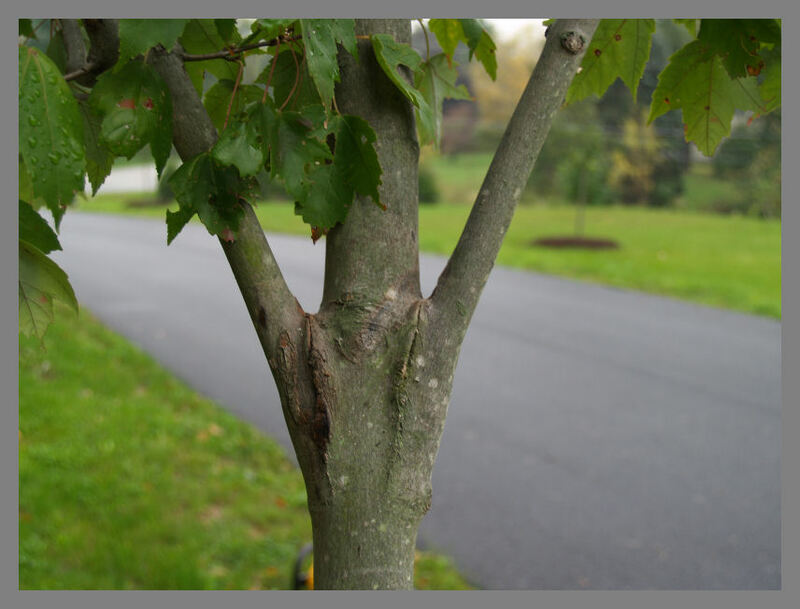 Treatments that torture trees such as piling the mulch against the trunk of the tree, must stop! I believe neglect of proper pruning is torture. These trees, if not pruned by SWUTB, will grow into self wounding trees that are short weak and will not provide satisfaction for very long. The money you spent on planting the trees is wasted. Arrows to left show a neglected tree. Eventually if not corrected the the tree will have stem failure. Arrows point to leaders that should have been removed many years ago. They are all coming from the same general location on trunk and competing for the sun. Eventually if not addressed, they will fail. This can all be avoided by some careful, selective, target pruning throughout the first five years by SWUTB. If you fail to do this, I believe, you are hurting the trees. Not everybody can prune a tree with the result - healthier, longer lived, safer and more attractive trees over time. 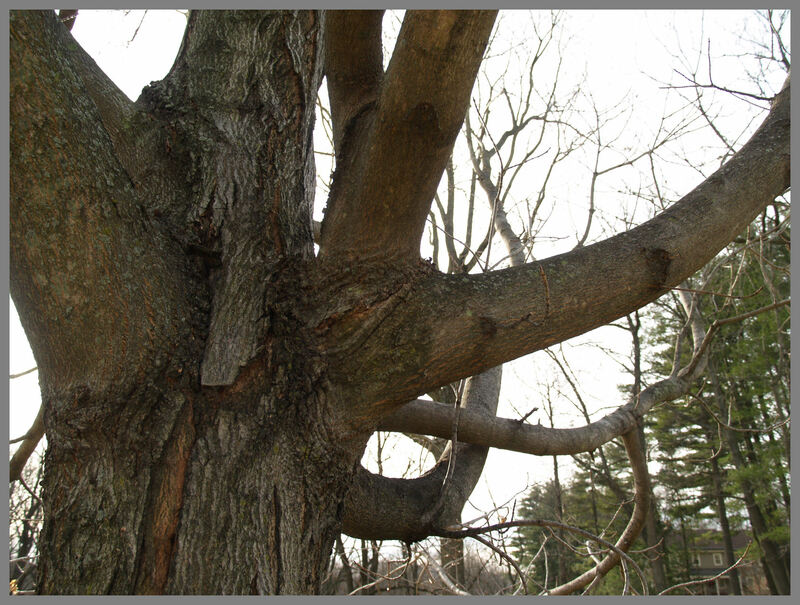 Too often trees are mutilated, if they are pruned, by people who know nothing about targets, timing and dose. On left is the same tree as above. Greenish arrows show some orf the locations we removed parts of this tree . 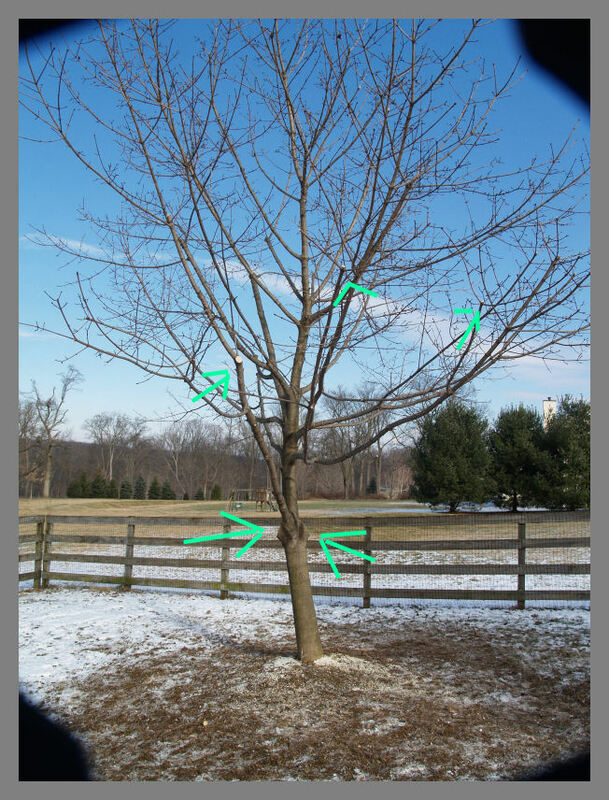 This is a young tree and can tolerate a large dose of pruning. This adjustment should have taken place many years ago. This stem was pruned incorrectly. A stub was left and as you can see, it was defenseless and soon became symplastless. This stub, which is symplastless, is a lollipop in a sense, for microorganisms to work their way into the tree or woody plant. 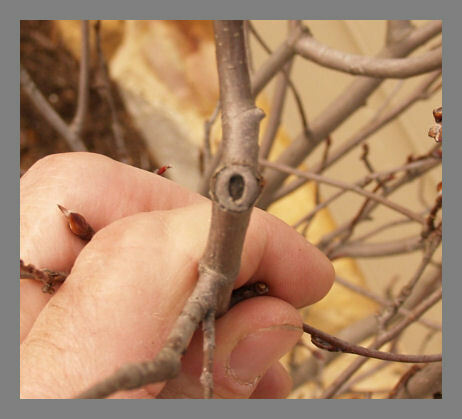 Here as you can see, the target was hit and the tree began to "seal" the pruning wound. Trees seal, they do not heal wounds. This will reduce problems associated with secondary organisms. 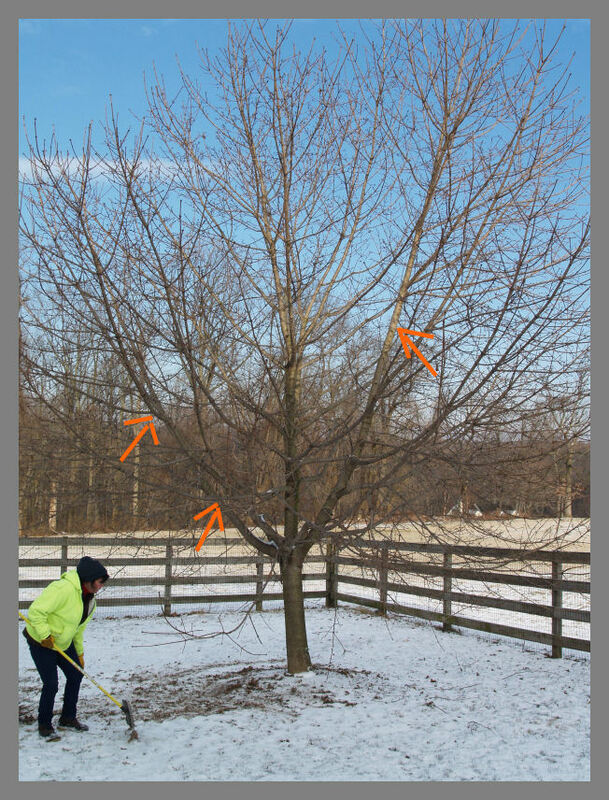 Video's of pruning these types of trees. Here are two v-crotches in two trees. These should be removed in the first five years after planting. Waiting at least one year after planting to begin training cuts for framework. Removing the lower branches over a three year period will strengthen the trunk. 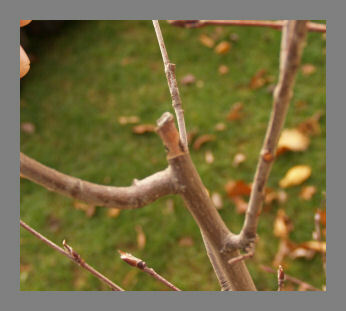 Pruning cuts should be made correctly. Must see Suggested book on "Pruning". 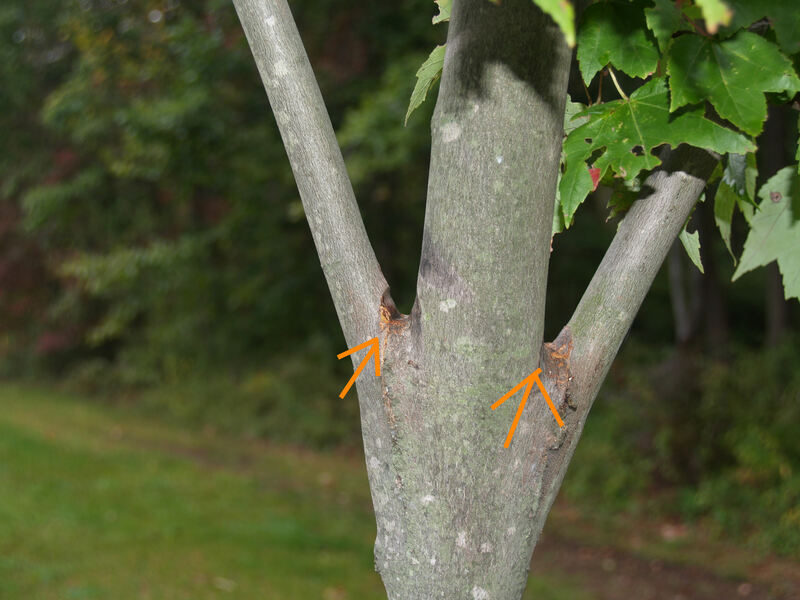 Notice the injury from the torture of wire in a hose in the v-crotches of this tree (arrows). Never torture a tree with wire in a hose and never place staking material in crotches!